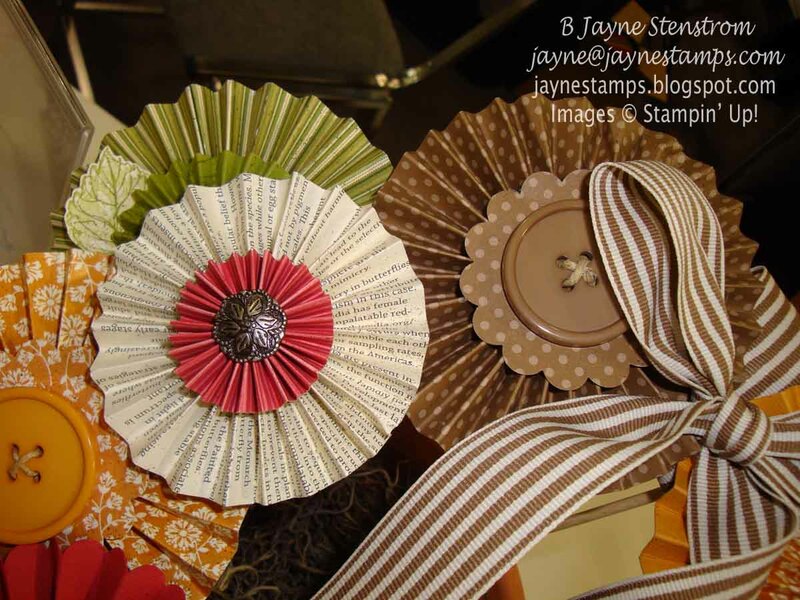 ~ ~ ~Jayne Stamps ~ ~ ~: Buy Three, Get One Free! Is it August already? Where does the time go? Well, since it IS August, I think we should celebrate. How about buy 3 packages of our exclusive Designer Series Papers and get 1 FREE! During August, you will get a FREE package of Designer Series Paper when you buy three! Use this limited-time offer to stock up on all your favorites, including brand-new designs from the 2011-2012 Idea Book & Catalog. There is no limit to the number of free packages of Designer Series Paper you can earn. I have some samples to inspire you to use the DSP you get besides in scrapbooking (because that just seems obvious to me). The first three are from 3-D items that were on display at Convention. Aren't these flowers adorable? And they are SO easy to make - especially with our new Simply Scored tool. Wait - what is a Simply Scored tool you ask? 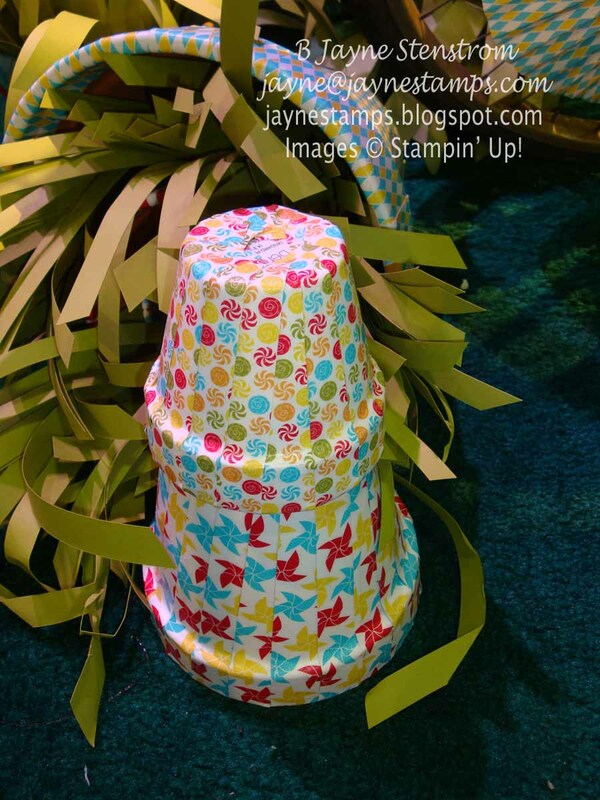 Well, it's one of the new items that Stampin' Up! unveiled at Convention - and it will be available next month in the new Holiday Mini Catalog. Unless of course you're a demonstrator, and then you could order it early...like I did today! I can't wait for mine to get here! Check out these flower pots. They are covered with strips of DSP! As far as I could tell, they were simply decoupaged onto the clay pots. Cuteness! 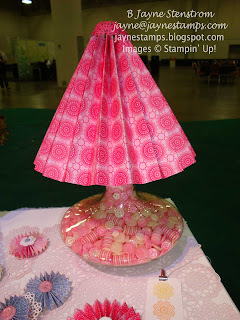 Isn't this just the sweetest little lamp you've ever seen? I love the shade made by pleating our DSP. 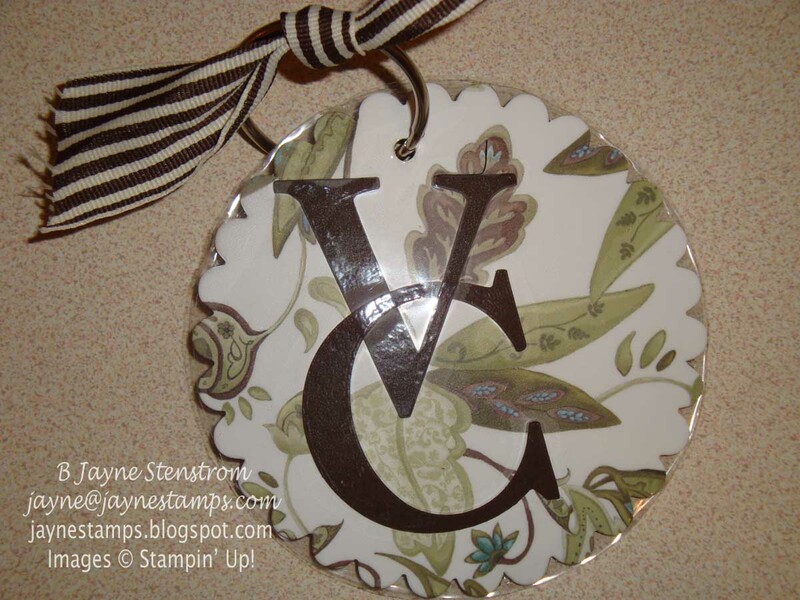 And the clear base is filled with Stampin' Up! 's designer buttons! I also have some card samples for you. 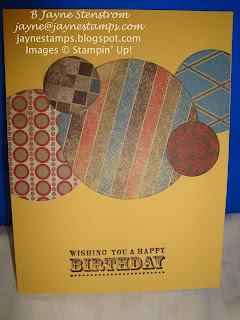 I love this first one - the creator simply cut out different sizes of circles to make the card. She used the new Well Worn DSP (love that paper!) 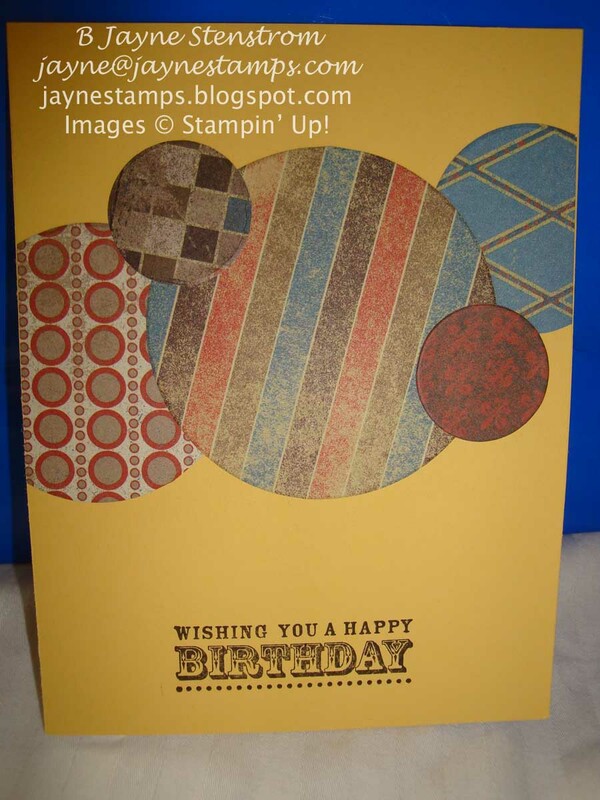 and with the subdued colors and simple circles, this makes an excellent manly card. Who would have thought of cutting the DSP in strips and laying it across the card front? Is that simple and easy or what? Here is another card that just pops because of the DSP. Using only one saying and some ribbon plus the DSP makes a bright and cheery card. 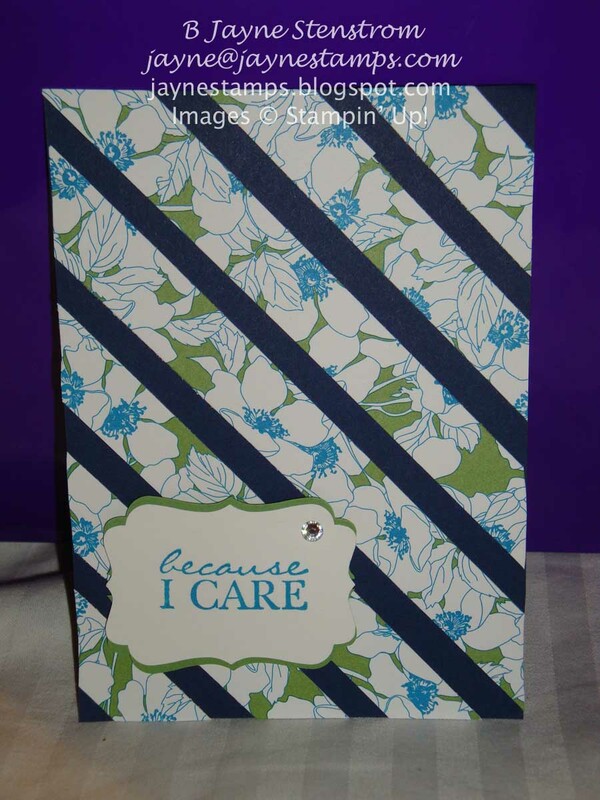 DSP makes creating a card quick and easy. I also used DSP for my roommate gifts at Convention. You can see the original post HERE. This is the inside of the one I made using the Paisley Petals DSP. And lastly (but certainly not exhaustively), how about making a luggage tag with DSP? 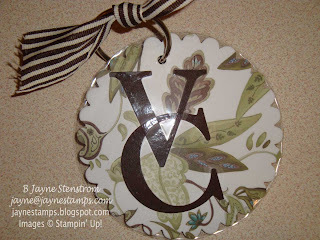 The ladies who made this took the paper from the Paisley Petals package, glued it onto chipboard, then ran it through the Big Shot with the Scalloped Circle Die. So what are you waiting for? Get that new catalog out and check out the great DSP we have this year! You can find it on pages 184-186 of the 2011-2012 Idea Book & Catalog.